6.71 points at 17 votes (rank 439). 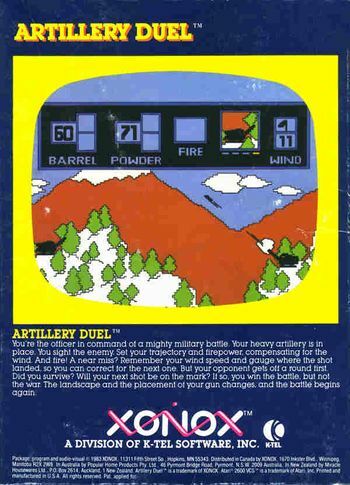 The game Artillery Duel is a 2-player game, (the computer cannot take over the role of the opponent) in which you have to shoot the opponent's tank. To make this not so easy, the duel takes place in the mountains. Furthermore, you need to watch the wind speed and direction while aiming and the shot must be placed within a certain time. Each action is done in turns, so first player 1, then player 2 etc. In short: adjust angle and power of the shot and then blow the opponent from the terrain... The classic game principle. The mountain is a fixed image and designed in simple colours. On it grow trees that sometimes aggravate hitting the opponent. You can destroy the trees and the mountains, if you miss the opponent and instead shoot into a tree or the mountains. If you shoot at one of the borders at the side, the bullet disappears and the colour of the border changes several times. If you shoot to far up, the bullet stays invisible for some time, but then returns to the field of vision. White clouds and radar are animated. Shooting sounds and a tune at level start and end can be heard. The formation of the mountains and the positions of the trees and tanks change in every round. After each round an interim result is shown and two of the winner's soldiers march over the game area. Sometimes, the second soldier walks too far and has to walk back again. until the shot has to be made. The status line in the upper area of the screen shows next to the current player and a radar also the current wind speed and the remaining time counting backwards until the shot has to be done. Joy left/right change between "Barrel"/"Powder"/"Fire"
Joy forwards/backwards adjusting the values for "Barrel"/"Powder"
Fire button fire the missile with "Fire"
There is not limitation to the number of rounds. The players need to agree before the start of the game, when the game will end. The more exact you hit the opponents tank, the more damage is done there. The opponent's tank can also be destroyed with a single shot! The direction and the strength of the wind can be recognized nicely by the speed of the passing clouds. Always keep in mind the wind speed of the last shot and then note the changes when adjusting the next shot. H.T.W: "A very simple but nevertheless motivating game principle which was probably converted on every console and computer type. Unfortunately, in this version the slow course of the game and the missing end evaluation tarnish the fun in the game massively. With 500% speed in the emulator it is, however, funny ..."
This page was last modified on 23 November 2014, at 17:24.